Teaching Authors--6 Children's Authors Who Also Teach Writing: Villains are People, too! April began this discussion on what we love about our writing. One of my favorite writing things is – believe it or not – the villain! As we know, fiction is primarily an emotional exchange. The reader stays connected to the hero because she feels her story. Madeleine L’Engle (“The Heroic Personality,” Origins of Story, 1999) offers that the heroic personality is human, not perfect. Not infallible or impeccable or faultless. Human. This sense of authenticity is important in keeping the reader connected to your story. But a hero is only as good as the villain of the story. You could say that you cannot have a good story without a good villain. Who would Beowulf be without Grendel? Frodo with Sauron? Oliver Twist without Bill Sykes? Peter Pan without Captain Hook? 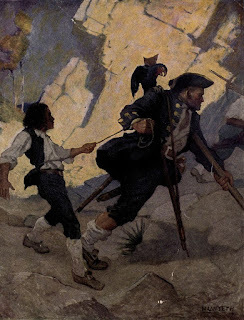 Jim Hawkins without Long John Silver? Like the hero, villains need motivation. If the plot is what happens to a character, then motivation is the force that sets it into motion and keeps it going. It’s why the villain goes after her goal in the first place. Villains have a history. And this history influences her motivation. Unless the villain was born evil, and few people are, villains are born human. Dean Koontz once offered that the best villains evoke pity, even sympathy, as well as terror. Sympathy for a villain, according to James Scott Bell (Revision and Self-Editing, 2008), deepens a story. A bully doesn’t pick on someone just to be mean. Why did he become a bully? Remember, Darth Vader in the Star Wars movies wasn’t always evil. In the beginning, he was an innocent, precocious and enslaved child, who grew to a teenager losing faith in his parental figures as he feared for the survival of his love, followed by his ultimate downfall when he was seduced by the dark force. We see the evolution of his evilness. But that’s not the end of his story, as we also witness his redemption when he meets his son, Luke Skywalker. And remember Mary Shelley’s Frankenstein monster was a sensitive, emotional creature driven by despair and loneliness to acts of cruelty. In the end, villains are people, too! One of my favorite villains is smooth-talking Long John Silver. He’s so personable, but Long John is greedy and cunning to the core. Ruthless and violent, he has the brains behind the scheme to recover Captain Flint's treasure. Had it succeeded he probably would have found a way to make off with the loot and leave his shipmates to face the gallows. Except, he developed a soft spot for Jim. He saved Jim. A villain with a heart. 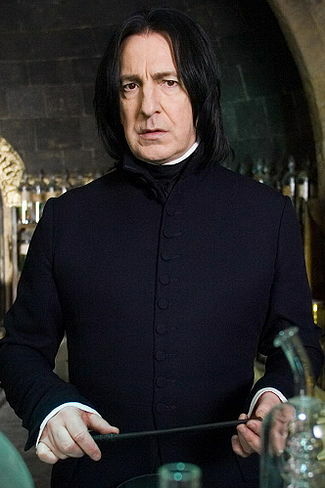 Another favorite villain is Harry Potter’s Severus Snape. Snape’s love of Lily, Harry Potter’s mother, is at the core of his motivation. Snape’s early involvement in Voldemort’s world, as a Death Eater and as Dumbledore’s spy, created the backstory for his choices, with tragic results. This spy-role meant that he would never have the chance to move on from his love for Lily. It was this capacity for love that made him so heroic, a villain who sacrificed the most important things in life to protect the son of the person whom he loved, a person who could never return that love. Snape remained the bitter, sour-faced man, but he is set apart from Voldemort by his courage and his ability to love. It was his love that redeemed him. As Harry told his son, Albus Severus, Snape was one of the bravest men he had ever known.The villain was the hero after all! Peter S. Beagley once wrote, “Great heroes need great sorrows and burdens, or half their greatness goes unnoticed. It is all part of the fairy tale.” Sometimes not only are the villains the most interesting characters, they are the most important, for the hero cannot begin her journey without the villain. And perhaps this is why it takes so much courage to write a story. As Anne Lamott suggest (Bird by Bird, 1995), “One way to do this is to look within your own heart, at the different facets of your personality.” Be brave, she warns, because you never know what you will find: a con man or a preacher, an orphan or a king, a child or a crone. When you explore the depths and shadows of your characters, including your villains, you are touching upon your own shadows. This becomes the paradox in storytelling: when we tell stories, we are making things up. This is, by definition, a lie. But every lie is wrapped in some emotional truth. Three cheers for our villains, who dare our heroes to become better than they ever imagined themselves to be! This is a terrific post. I love the quotes you used and the post is full of great reminders. I will be posting the link on my blog. Thanks! Super post, and that last sentence about villains says it all, "...who dare our heroes to become better than they ever imagined themselves to be". Thank you so much for sharing Teaching Authors, Rosi! And I'm pleased you found this helpful! Rebecca: I know, right? It's the villains who make the heroic possible! Thank you, Marti! COURAGE TO WRITE is one of my favorites! Thank you, everyone, for stopping by! Insightful post! I love all of your examples. Wonderful post! I agree villains are best when well-rounded and sympathetic. Your villain discussion choices are spot on! Bobbi, this is a great post about villains. Love it. I copied and saved this brilliant post, Bobbi, to share with students. I promise I will credit you! Realizing that everything I gave to my Hero, my Star, I had to give to my Villain was a YUGE AhHa! in my writing career. Yvonne, Marcia and Carla: Thank you so much for your kind words and for stopping by! Esther: I've always loved grand adventure stories. This is probably why I write adventure stories, and my villains are some of my favorite people! Thank you for your kind thoughts, and I'm glad you shared your a-ha moment!